Jordan Spieth is a great, great golfer. There’s no doubt about that. And he has an interesting style that is uniquely his own. When he plays golf he has an uncanny ability to make a 65 look like an 85. But he keeps shooting low scores over and over again without looking like he’s playing particularly well. 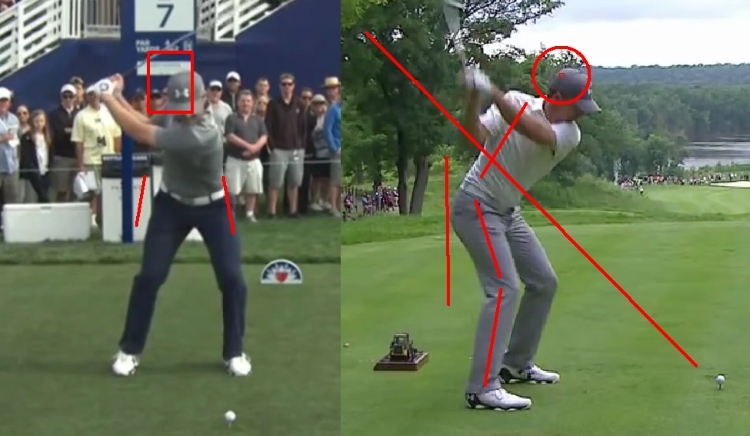 So it was very interesting to do a swing analysis on Jordan’s golf swing. And below you’ll see the result of that swing analysis. Before you read that however, I just want to let you know how I did this swing analysis, because at some point below you’ll see how surprised I am at a couple of things Jordan does. To do this swing analysis I had Jordan’s face on and down the line swings in my swing analysis software. 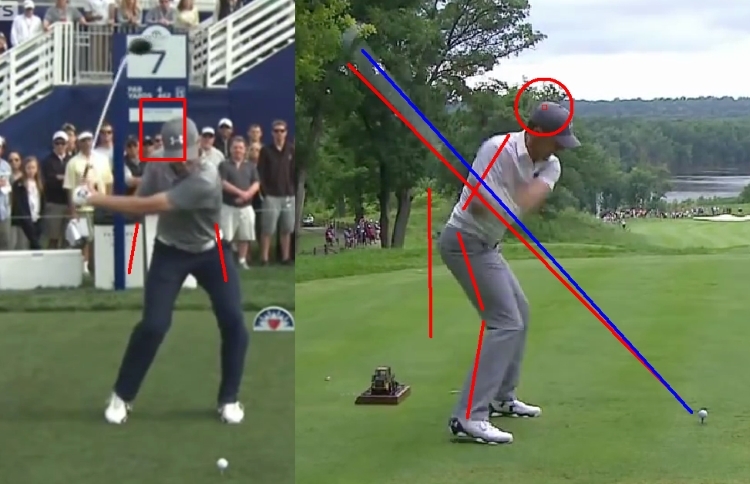 Then I would take snap shots of each aspect of his swing and then move the swings on a few more frames. At the same time as doing that I was writing the review below. So when you read my surprise at the moves it’s genuine. I was a bit shocked at some of the things he does. However, it just goes to show you that there is no perfect swing for one person. But instead, everyone needs to find the perfect swing for them. 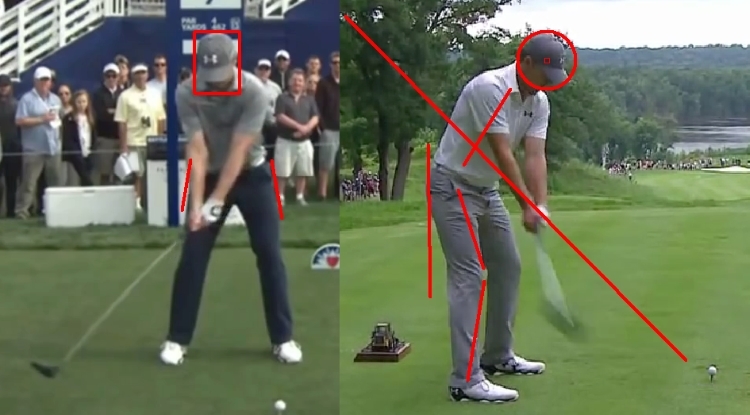 Like all my reviews, we’ll start by looking at Jordan’s setup position from the face on view and down the line view. There’s not much to say here because he has a great setup position. Good posture. Good alignment. Good distance from the ball. Good ball position. 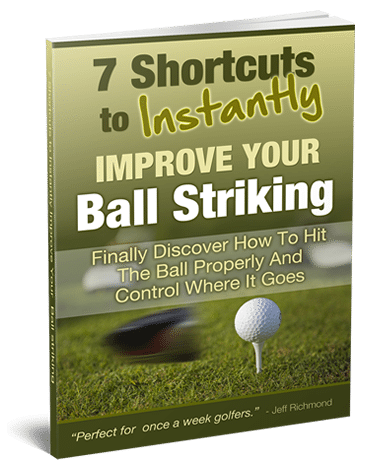 He turns his head to the right quite a bit at setup, sort of like Jack Nicklaus although he does this before taking the club away, where Jack used his turning of the head to the right as a swing trigger. I have heard he doesn’t like hitting shots to the left so maybe that’s why his grip is now like that. 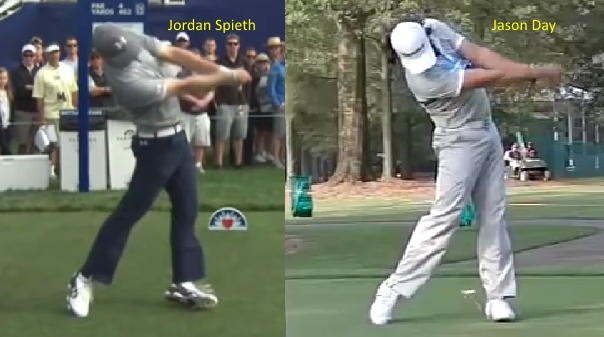 Because I have seen footage of Jordan swinging as a 14-15 year old and his left hand grip then was pretty strong. So as he’s got older and stronger his left hand grip has gotten weaker and weaker (turned more to the left). That just shows you that the grip is not as important as a lot of people make out. OK, let’s look at Jordan’s take-away. That’s a nice, one-piece take-away. There’s not a lot of moving parts there. It’s just a turn with the shoulders and the hands are quiet. There’s a couple of interesting things to note from the positions above. 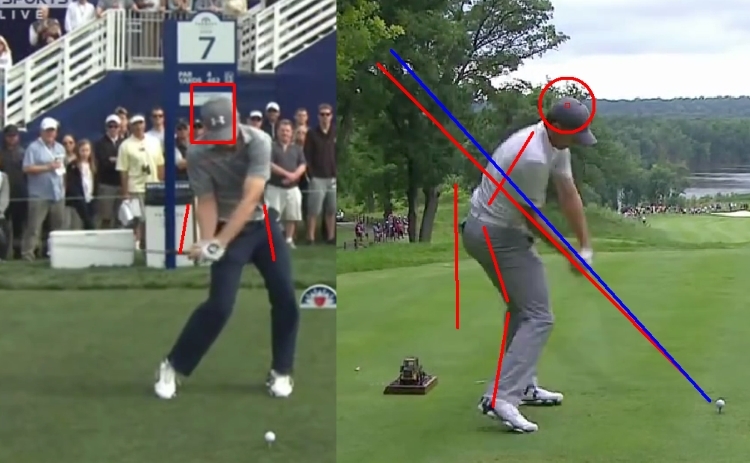 The first is that his hips have hardly moved at all in terms of lateral movement. Also, his head is very, very still. It hasn’t moved. But his right leg has straightened in the backswing, which is interesting. But let’s see what happens with his hips and head from now on. 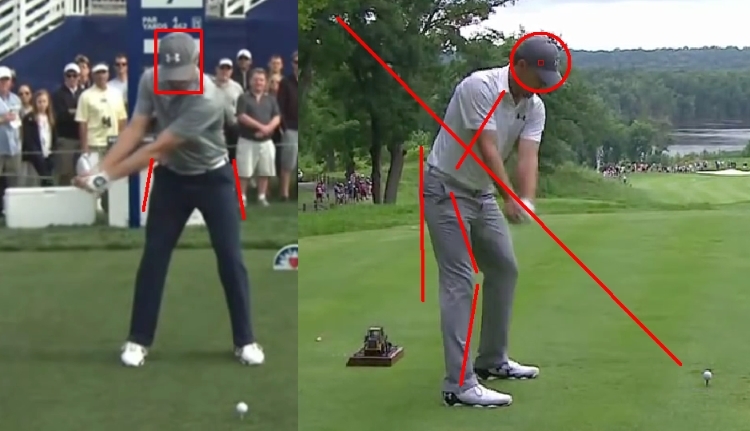 At the half-way point in Jordan’s swing (above) his hips have not moved laterally at all. His head is in the same place it was at setup although a bit lower. His swing plane is very good, just inside the ball. At the top of the backswing Jordan’s hips have now moved laterally to the right. 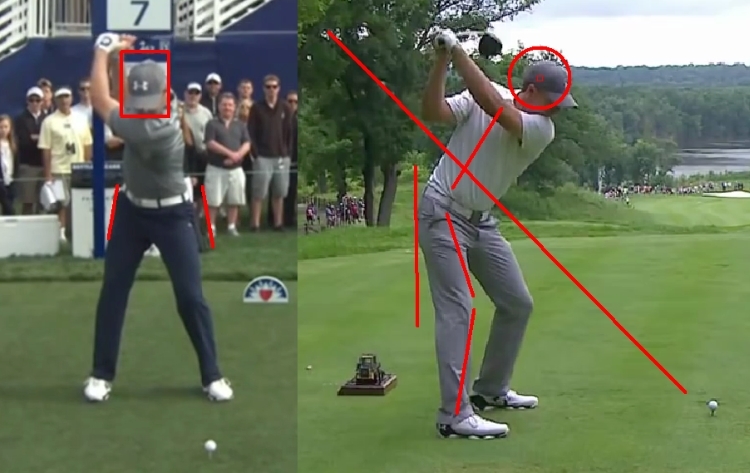 It’s a bit weird that he does that from the half-way point in his backswing to the top of the swing. It’s no biggie but just a bit different… the timing aspect of it. 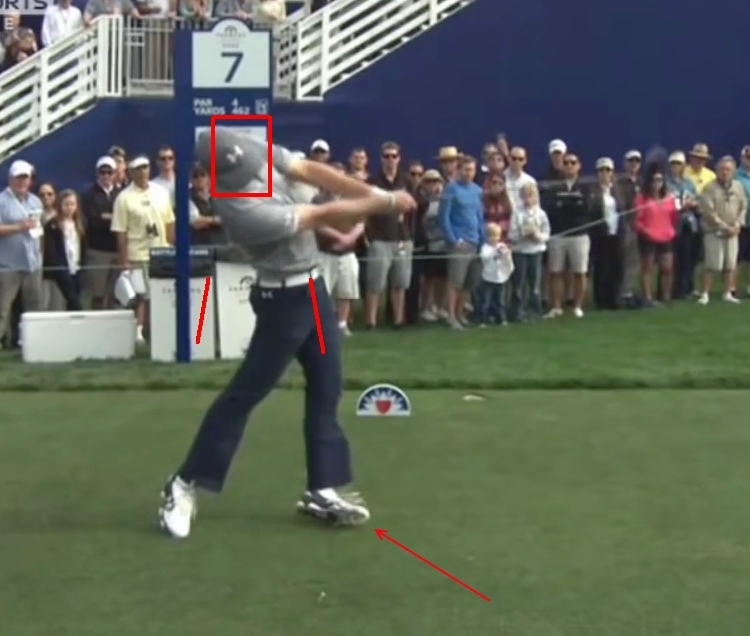 At the top of his backswing notice his head is pretty much where it was at address but a bit lower. His right leg has straightened in the backswing, which is fine. A lot of great players do that. His top of the backswing position is fine, even with a bent left arm. Who says your left arm must be straight at the top of the backswing? Now here’s something interesting Jordan does as he’s starting down. At the start of the downswing Jordan squats down, which is fine… but look how far in front his head is from where it was at setup. In all my research of great golfers swings, that’s quite unusual to see something like that with a driver. 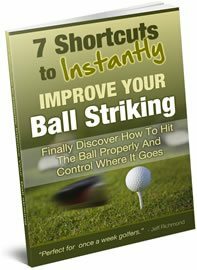 You see that more with irons when a golfer is trying to hit a punch/low shot, but not with a driver. It will be interesting to see if before impact he pulls his head back. 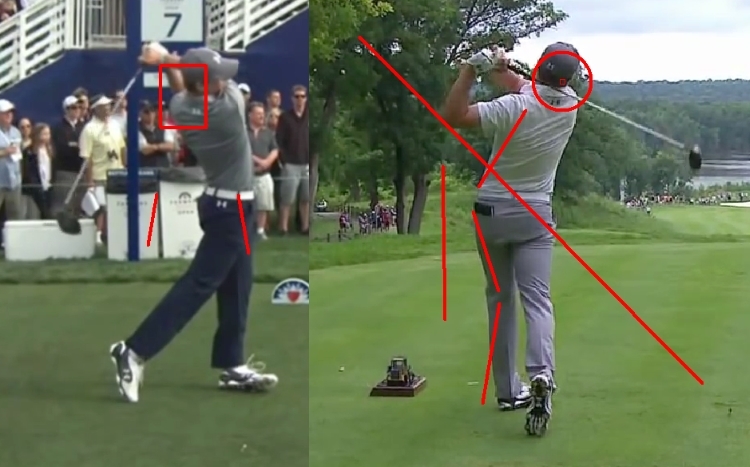 At the half-way point in the downswing (above) Jordan’s head is still well in front of where it was at setup. But the big saving grace is his swing plane. His downswing plane is right where it should be, as I teach in my Easy Swing Plane system. If you look at his right foot from the face on view that looks a bit odd. It looks like it’s moving forward – straight ahead, instead of moving to the inside. That’s probably a result of him being so in front of where he was at setup with his head. I thought at some point his head would have to come back to somewhere close to where it was at address. And in the face on view above you can see that’s happening. But look at that right foot… What the heck is he doing there? It looks like an Elvis dance move! 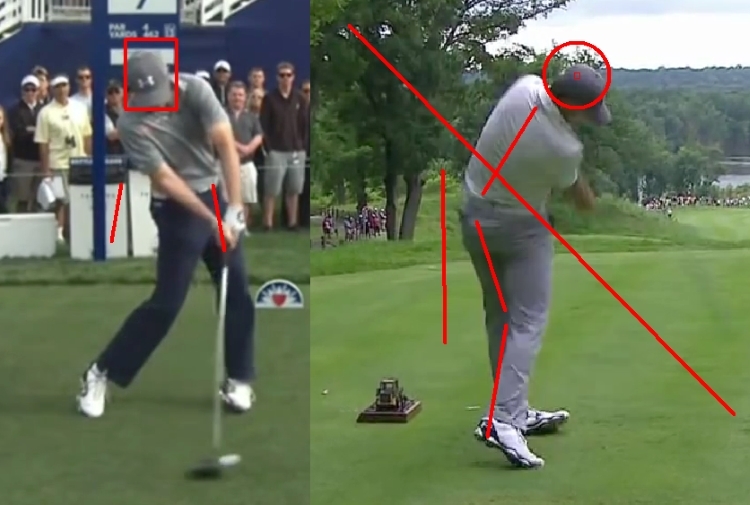 At impact his head is back where it was at setup although lower. 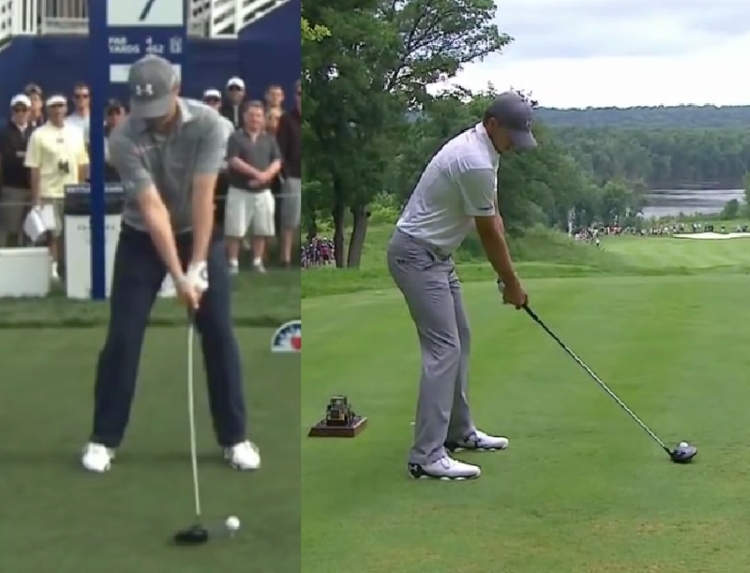 He has quite a lot of forward shaft lean on the club at impact. But look at each of his feet. His right foot is going straight up. It’s not angled in like most great golfers at this point in the swing. His left foot is rolled over a lot at this point. It must put a lot of stress on your ankle to do that. Anyway, let’s see if he continues to roll over on that left foot a lot in the follow-through. Now, into the follow-through his head is going back and look at that left foot. It’s rolling over more! He really pulls the club through impact without much rotation of the arms. Look at this picture above, there’s not much in the way of forearm rotation. It’s a big body turn that is releasing the golf club. But look at the left foot again. It’s just off the ground and rolled excessively on the outside. His head is going backwards too. At the finish of Jordan’s swing he’s in good balance. His left foot is still rolled over but not nearly as much as it was during the follow-through. His right foot is in a funny place but hey, the golf ball doesn’t know that. 1. The head moving forward in the downswing and then having to move back late in the downswing. 2. The amount of roll over on his left foot. 3. The late lateral move of his hips in the backswing. My big concern however, long term, is his left ankle. Doing that left move move is going to put a lot of stress on that ankle and possibly his left knee. Here is a picture of Jordan Spieth vs Jason Day half-way into the follow-through. 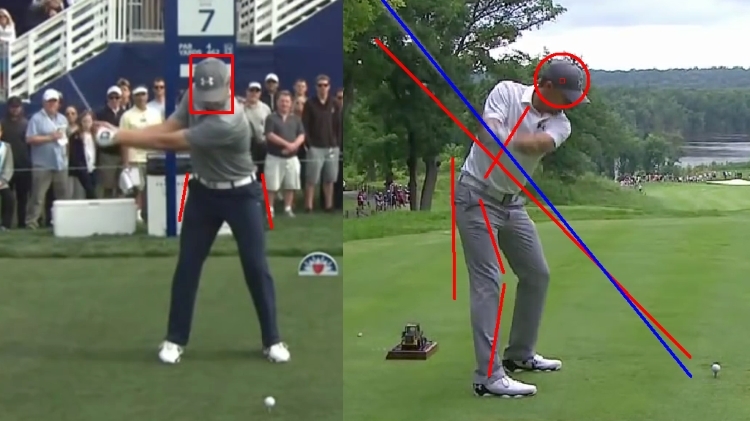 Compare the upper body positions and they look very similar. Compare what is happening from the knees down and they look, very, very different! Jason Day’s footwork is textbook perfect. Jordan Spieth’s footwork is odd. You would never teach anyone to have footwork like that. And pointing that out obviously has nothing to do with results. You can’t fault his result so far in his career. But it may affect his career long term. I would have thought from a bio mechanical stand point it’s not the best move to make if you want a long career, but I’m not a biomechanical expert so time will tell I guess.